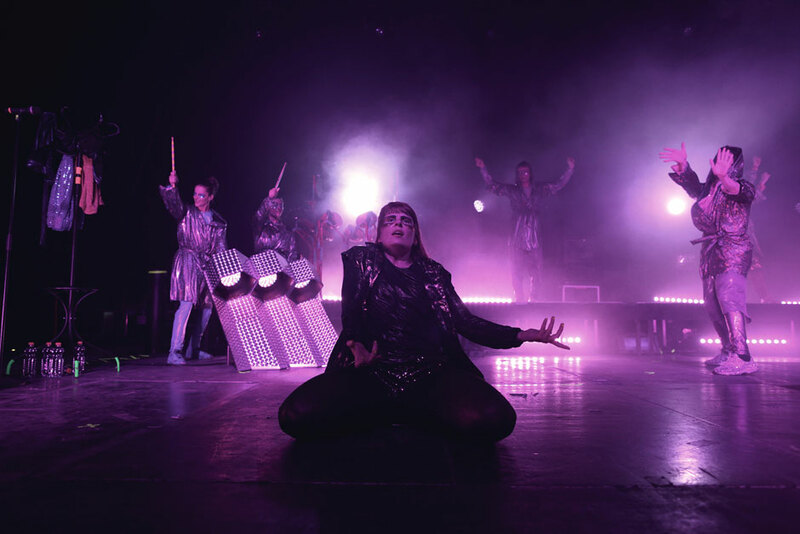 Challenging the audience on various levels and moving effortlessly from experimental performance art to overblown pop phenomena, The Knife’s Shaking The Habitual tour more than lives up to its name. Daniel Jones reports from their Berlin show. All photos by Erez Avissar. 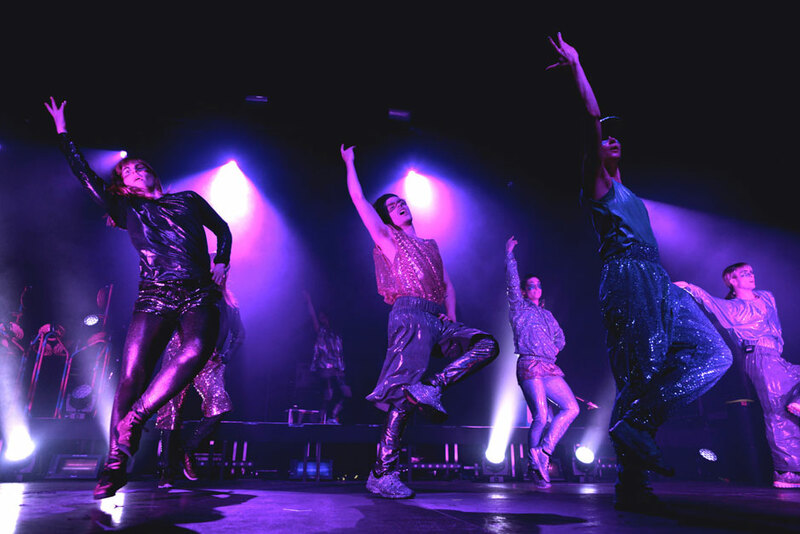 There’s been much speculation and heated debate regarding The Knife’s current live performance, with some celebrating the dissection and reconceptualization of what we perceive a live show to be and others lamenting the extreme use of playback and lack of live instrumentation. The stakes are, of course, high; Shaking The Habitual is the Swedish duo’s first album since 2006, and only their second tour in their 14-year history. With a sold out venue of rabid fans facing you, most bands would want to bring their A-game. The mistake that people make, however, is thinking of The Knife as a band, when in reality they’re closer to performance artists. As I stood in a crowd of 3,500 people becoming increasingly agitated by the delayed wait, a picture of the plan behind the scenes began to come into focus. That was then upgraded to HD as openers D.E.E.P. Aerobics appeared—to the left of the stage, which meant that only a portion of the crowd had any idea who was suddenly trying to lead them in a ballroom-themed R&B workout. It was borderline parody, equally ridiculous and amazing, and not at all what anyone expected. I felt a ripple of dissent make its way through the stoic German crowd, who seemingly wanted nothing more than to hear the entirety of Silent Shout and be on their way. Amidst shouts of, “Put your hands up!” and, “We’re all in this together!” I could make out mutters of, “Was ist das?” and even someone complaining about “black music.” As much as I appreciated the outlandishness of the whole thing, the rather straightforward attitude of the audience toward what should be fun made me wonder if this was also part of the plan: to not only engage the audience, but also to enrage them in the tradition of musical agitators such as Whitehouse and Einstürzende Neubaten. When The Knife finally did take the stage (after an even longer delay) it was amidst a wall of fog, cloaks, and heavily droning electronics, the antithesis to the brightly colored crowd before them. As the throb of bass gave way to the discernable beats of “Raging Lung”, the restless crowd began to finally move, shaking the residual angst from their limbs even as the performers on stage—of which there were about eight—began to play their instruments. Or did they? The line between illusion and reality was blurred as multiple people took the mic to unleash Karin Dreijer Andersson’s voice from their lips. Fantastical instruments were shifted about the stage as often as the performers, and it was impossible to tell what (if anything) was really being played. 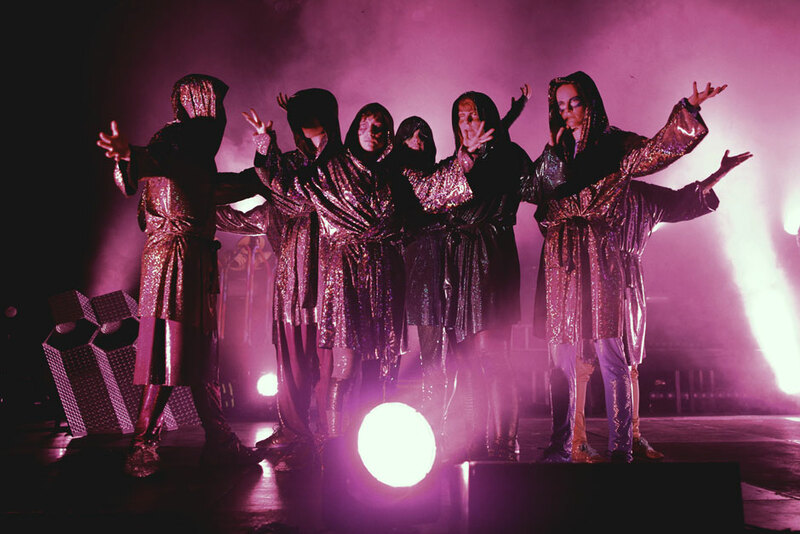 At several points the pretense of live musicianship was abandoned entirely in favor of strange props (a drum machine obelisk and a large screen featuring Karin in Olof drag simply bobbing her head to the beat being two of the most captivating) and glittery synchronized dance performances set to backing tracks. 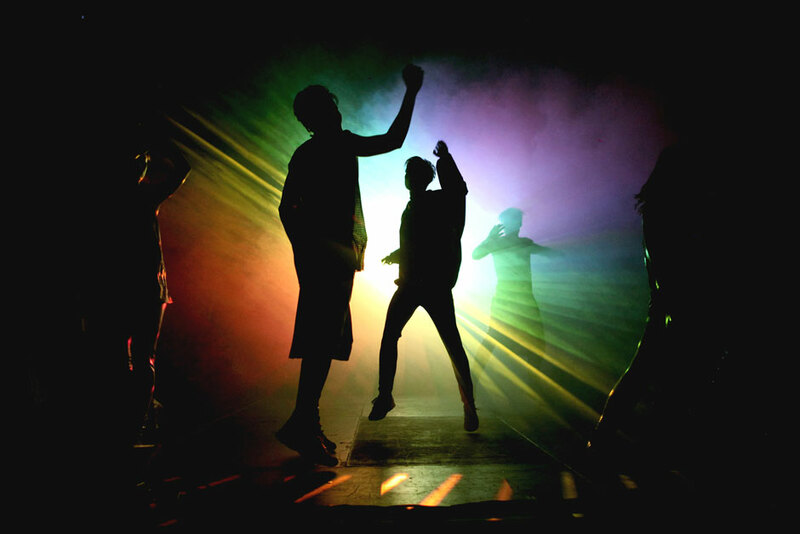 For at least half of their stage time, the performers evoked bouncing choreographed fervor and summoned a vast amount of energy into the room, almost swallowing the crowd in its ecstasy; Godspell evoking the Godhead. If a mood could be ascribed to the whole thing, I’d settle with ‘brilliantly cheeky’; at times the band would actively taunt the audience’s expectations, disappearing offstage entirely for “Networking” (of which I did a bit with my neighbors as I waited for them to return, so perhaps that was the point) to huddling on a corner of the stage for 2/3rds of “Full of Fire” before breaking into interpretive dance. By the time they’d skipped offstage, smiling toothily like Britney amidst a wall of rainbow lasers and the ending notes of “Silent Shout”, the crowd (myself included) was ready to collapse—not only from exhaustion, but also from trying to process the various levels of what we had just witnessed.